The Accelerated Bachelors to Graduate Degree Program (ADP) is designed to provide a more efficient means to obtain a graduate degree. The program is for students who have a high GPA and want to start taking courses that will count towards both their undergraduate and graduate degrees. The ADP allows a student to begin accumulating up to twelve credits towards completion of a graduate degree while still enrolled as an undergraduate. Undergraduates participating in this program are given an early decision on their graduate application pending successful completion of the baccalaureate and are allowed to take specified graduate level courses during the spring semester of their junior year and/or during their senior year. Qualified UNCG undergraduates who are pursuing the B.A. or B.S. in Mathematics may apply for admission to the Accelerated Degree Program and the M.A. in Mathematics program. 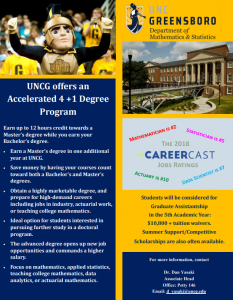 A cumulative undergraduate GPA of at least 3.5 based on at least 30 hours earned at the UNCG is required. Applicants must have completed at least 60 semester credits and may not apply for admission to the ADP before the first semester of the junior year. Applicants are also required to take the Graduate Record Examination (GRE). All applicants must submit the Request for Accelerated Degree Program to the Graduate School and must simultaneously apply for admission to the M.A. program in Mathematics. Interested students should first contact Dan Yasaki for further details.